Our friend Bill died last night. Bill was an incredible man. He is one of the smartest men I knew. He also shared my love for travel. And he happened to be on dialysis. I first met Bill after I had re-joined DCI after completing residency. I visited Northwest Kidney Centers to learn from Joyce and her team. When I got there, Joyce said to me, “Doug, there is someone I need you to meet.” She introduced me to Bill and Bill, Joyce and I had the best conversation about so many different topics. The number one thing that I remember about this meeting is that he told me that DCI needed “to fight above its weight class” in pushing for changes to improve care. During that trip, I also found out from Bill’s friend Jim Smith that they were planning on taking a rafting trip down the Rogue River and that he had two extra spots for the trip. I walked out of the room and immediately called my wife – “Kath – please, please, please – can we go on this trip?” I wish I could have seen her face on the other end of the line. She agreed, and we both took the trip down the Rogue. The trip down the Rogue was incredible. Also on the trip for DCI were Lauren Hollingsworth, Kyle Nuckolls, Cheryl Conquest and two summer interns, including Vlad Ladik’s daughter Sasha. Fantastic rapids, beautiful wilderness, and we got to sleep on beds. We also talked a great deal with Bill, Kay Deck, Gary Peterson, Dan Larabee and his wife Connie about how care needed to change. As we neared the end of the trip, we started paddling backwards – we did not want the incredible experience to end and we wanted to stay on the river. We also didn’t want to leave Bill. Bill told us that he was going to visit a redwood forest later that day, so we followed him. On the way we had a few stops for the “urinators” in the group, put our feet in the Pacific Ocean, and wandered with Bill in the Redwood Forest. By the time we got to Portland Airport, I think it was 3 AM and our flight was scheduled to leave in a few hours. The Rogue Trip was a proof of concept trip to the Grand Canyon. If we can do three days on the Rogue, why can’t we do eight days down the Colorado River? The trip through the Grand Canyon was incredible. The water was SO cold. The temperature was SO hot. Beautiful scenery that someone can only see from the river, hail storms, intense rain storms, always changing, never knowing what was coming next. Below is a link to a video that our friend (and guide) Kat took during the trip. We are halfway down the river, at a place no one can reach without going down the river, and a spot that no one on in center dialysis could experience. We had climbed to the beautiful spot, walked along this treacherous ledge where Bill and Kyle thought they were going to die (We are very happy that there is not a “Bill Peckham Falls” in the Grand Canyon), and then this intense hail storm hit us without warning. We got under cover just in time. On the last day of the trip, we floated down the river and all shared our thoughts about the trip. When it got to Bill, he took some whiskey. Then some more whiskey. And he started talking about the lonely journey of a person on home dialysis. He also thanked us for sharing his dream with him. Bill continued to fight for better care and continued to live “the breadth of life.” I visited him in the hospital a few months ago. I thought I would get to see him for an hour. We spent the whole day together. Pramen Applasamy is going to be working on an improvement to Darwin based on Bill’s recommendations that day. On that day, once again, I felt that I was sitting at the feet of a legend. He saw things with such clarity and purpose. After Lauren and I returned from the Rogue trip, we met in her office and agreed with each other that we would work together to improve care for people with kidney disease. This was the beginning of REACH. I feel like Bill is still with me. He is in my heart. And I think I will be pushing harder for us to improve care. When I do, you will know that Bill is at my side. 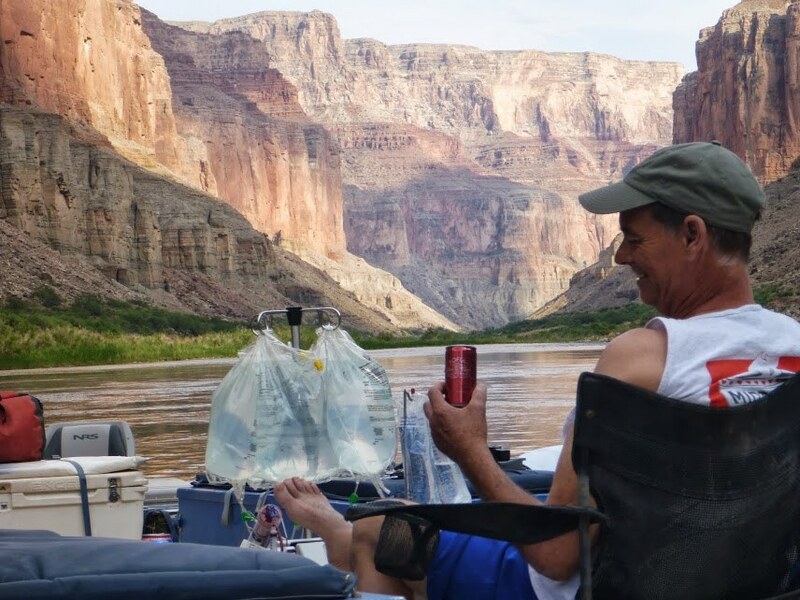 Bill Peckham, was able to live his dream of rafting the Colorado River through the Grand Canyon while still completing his dialysis treatments. Below is his account of the amazing trip. This is my favorite photo from my first trip down the Colorado last July. It’s July Fourth; we are beached for the night below the Nankoweap granaries. You have probably noticed something odd about this photo, the answer is down there by my foot, that red cylinder is an artificial kidney – I’m undergoing hemodialysis, the first of three treatments I received over our eight day trip. This photo shows my ultimate Independence Day celebration. Hemodialysis (HD) is a medical procedure that can do a lot of the work normally done by healthy kidneys. My kidneys stopped working in 1988, at the age of 24. Initially I tried to replace my sick native kidneys with a kidney transplant from my brother but unfortunately, my kidney disease (a particular type of FSGS) attacked my brother’s kidney too. I needed to start using dialysis in 1990, and I’ve been using HD ever since. Over two million people use dialysis worldwide. 400,000 people in the US use dialysis with 90% traveling to a dialysis center three times a week for a 3 to 5 hour treatment. I dialyzed at a conventional dialysis center (in-center) for 11 years. 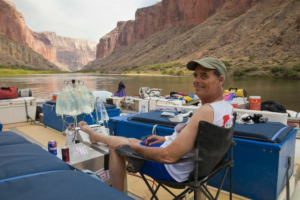 Dialysis did not keep me from traveling, I could still go to Rome or South Africa as long as I was close to a dialysis center, I just couldn’t climb Mount Everest or raft through the Grand Canyon. Since 2007, I have used a transportable HD device called the NxStage System One (my foot rest in the photo). My dialysis provider, Northwest Kidney Centers in Seattle Washington, is an innovator and leader in providing dialysis outside of the conventional dialysis center. The more I used this system, the more I began to realize… maybe I could raft the Grand Canyon after all! In 2012, I decided to make it happen. I contacted the National Park Service that encourages accommodations for people with medical needs. However, it was really Arizona Raft Adventures (AZRA) and the wonderful AZRA team that made the trip possible. The logistics were challenging as we planned for the adventure. Because of the time requirements for dialysis, the only way to do this trip was as a private group. I coordinated with Kim to reserve all of the spaces on the trip. AZRA got permission from the Park to bring a generator that powered my HD unit. I needed a lot of space for my equipment and supplies so AZRA added a second motorboat to make sure we had plenty of room. Randy, our lead guide gave me confidence as soon as I met him, confidence reinforced day after day on the river. The entire crew Randy, Dave, Amanda, Kat and Chris were outstanding as they kept us fed, entertained, informed and safe. We had great runs through the rapids and daily fantastic side trips. We had July weather: wind, rain and hail, alone and in combination. I had a dozen moments of a lifetime, besides the moment in the picture. I will cherish these memories for the rest of my days but I also received something from the trip I cherish even more, something I did not expect, the trip gave me a deep sense of gratitude. Seeing the Canyon was a gift. I am so thankful for this gift. People all along the way said yes. Yes, you can do it. Yes, we will take you. Yes, I will go … thank you, thank you, thank you. This photo is the perfect celebration of July Fourth because I see my Independence from the tyranny of incenter conventional dialysis. In this photo, I see my Independence from the widely held expectations of what it means to need dialysis. I see myself living the life I was meant to live.